Smart phones promise a lot of computing power and connectivity: We can search the Web and communicate from anywhere. But it can be hard to make full use of all these capabilities on small screens with tiny buttons. Now comes a new wave of applications that combine speech recognition and artificial intelligence to help people carry out simple tasks on their mobile devices. The latest such service, from Vlingo, a company that makes voice-recognition applications, tries to go beyond earlier apps by combining a user's spoken commands with personal data and information stored online. 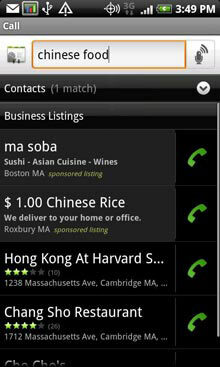 Called "SuperDialer," the service can, for example, let a user say "Call pizza" and subsequently see a list of nearby pizza places drawn from both the user's address book and the Web.